There is a tremendous matchup tonight, and that is between the brothers Gasol. Tweet me (@BalesSJustin) and let me know what one you think will have a better night! In this article, I will be providing you with Daily NBA picks for DraftKings for 12/16/15. The picks will range from some of the elite players, to mid-priced options, and value plays. Without wasting anymore time, let's get down to it! Get an edge on your NBA DFS competition with cutting edge tools, projections, lineup picks, and key stats. 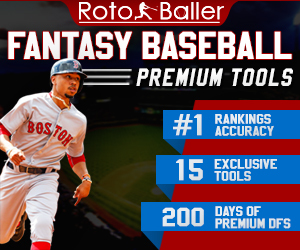 Our NBA DFS Premium Subscription includes our DFS Value Picks Tool, Daily NBA Projections, and our DFS Cheat Sheet with Key Lineup Picks to help you win DFScash games and GPPs. We offer weekly, monthly or seasonal Premium NBASubscriptions. Walker continues to flash great upside for his price, while also showing a bit of consistency, as well. Tonight, he gets a great matchup against the Magic, who love pushing the pace in games. Orlando also plays very sloppy defenses, which allows scorers to dominate them. Walker is a great scorer for the Hornets, as he’s averaging 18.0 points per game this season. Walker should have very little trouble scoring the ball tonight, while adding a few extra peripheral stats, which makes him a great play in all leagues. Holiday has been playing more and more minutes as the season progresses, and it looks like he may play upwards of 30 minutes tonight. That’s more than enough time for him to hit value at his current price tag, as he has scored 30+ fantasy points in four consecutive games. He’s scoring fairly well for the Pelicans, but he can also contribute in each of the other four categories. He gets a good matchup against the Jazz, who have struggled on defense a bit without Gobert. Even with the minute’s restriction, Holiday can be used in all leagues for his low price tag. Aside from one game, in which nearly all of the Pelicans starters were benched and Evans only played 18 minutes, he has been dominant this season. He’s a five category contributor, who has triple double potential every time he steps on the court. He’s a huge part of the Pelicans offense, and he touches the ball nearly every possession. The matchup isn’t as bad as it looks on paper, as the Jazz are playing slightly faster than when Gobert is in the lineup, and Evans makes a good play in all leagues. Wesley Matthews is getting all of the publicity for the Mavs right now, but Raymond Felton has also been playing extremely well. Over the last 10 days, Felton is averaging 12.0 points, 6.5 rebounds, 6.0 assists, and 1.5 steals per game. He’s consistently hitting value, and even triple doubled a couple games ago. He’s playing minutes in the mid- to high-30s each night, and he’s an extremely safe option against an up tempo team in the Pacers tonight. Felton can be used in all leagues until his price reaches his production. Leonard has been one of the hottest players in the NBA over his last couple of games, as he’s averaging 42.8 fantasy points in only 27.3 minutes per game. The only issue is that he is barely playing any minutes because the Spurs have been blowing teams out by the start of the second half. They face a fairly competitive Wizards squad tonight, and I’m not going to predict a blowout here. Leonard gets a great matchup, as the Wizards have really struggled to guard the small forward this season, and he can be used in all leagues tonight. Barnes should be one of the first players you insert into your lineups tonight. He has drawn the start in each of his last two games, and he’s averaging 39.6 fantasy points per game during that span. He will draw the start against tonight against an up tempo Chicago team, and Barnes should have no problem hitting value at this ridiculous price tag. He has been contributing in all five categories over the last two games, although he mainly scores with points and rebounds. Regardless, he should be a staple in your lineups tonight. Millsap gets a great matchup against the Sixers tonight, and he’ll make a great play in all leagues if the Hawks opt not to rest him. Millsap, along with others, sometimes get benched in cupcake matchups, but he has been struggling a bit recently, and the Hawks may use this game to break him out of his slump. The Sixers have been the worst team in the NBA against power forwards this season, and Millsap has been extremely successful for most of the year. He should be able to dominate the Sixers bigs, but he’s best suited for GPPs because of his hefty price tag tonight. I continue to use good rebounders against the Blazers, which is why Ibaka is a recommendation tonight. He’s coming off a good game against the Jazz, in which he blocked six shots, which shows a bit of his upside. Durant and Westbrook account for most of the Thunder’s offense, but Ibaka can pick up the scraps and he also can contribute rebounds and blocks at a high level. Even with a somewhat low price tag, he isn’t a very safe option, and he can be used in tournaments tonight. It’s a matchup between the brothers, and either one makes a great option tonight. Marc is just a tad bit cheaper, and he will likely see more minutes than his older brother. 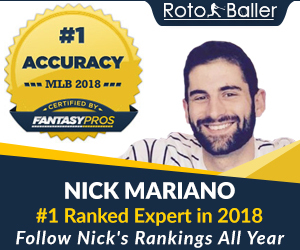 He has great upside, as he has flashed the ability to contribute in all five categories, and he has recently scored over 70 fantasy points in a game. The Bulls have really struggled to guard the center this season, and Marc Gasol can be used in all leagues tonight. Our NBA Premium Subscription goes above and beyond standard DFS tools. 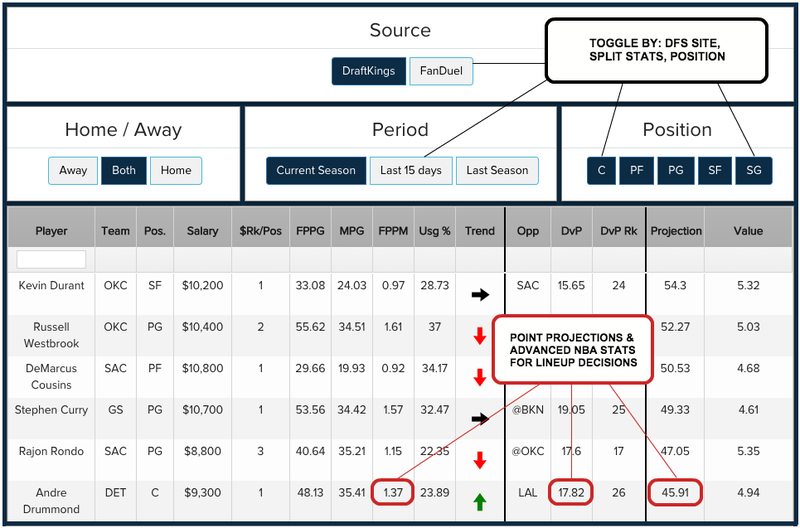 DFS Value Picks Tool: Brand new for 2015, this cutting edge tool will help you find, sort and filter the best value and sleeper picks for each day of NBA DFS action. With premium stats like "Usage Rate", "Trend" and "Value", you will have a serious leg up on the competition. 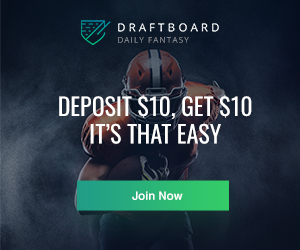 Daily NBA Projections: Meticulously researched daily NBA projections for FanDuel and DraftKings. We will have our projections live shortly. If you're already purchased your NBA DFS Premium Subscription, you can access it here.